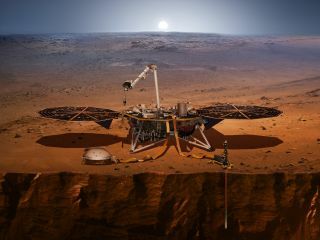 An artist's impression of InSight on the Martian surface. Note the seismometer on the ground on the left, and the HP3 instrument that has been hammered into the ground on the right. The Gravity Assist Podcast is hosted by NASA's Chief Scientist, Jim Green, who each week talks to some of the greatest planetary scientists on the planet, giving a guided tour through the Solar System and beyond in the process. This week, he's joined by Bruce Banerdt, the principal investigator for InSIght Mission, which launched on 5th May 2018 and will reach the red planet on 26 November 2018, to discuss the mission and the science it will conduct on Mars. Jim Green: The name of NASA's latest Mars mission, InSight, is an acronym. What does it stand for? Bruce Banerdt: Seismology is the method that we've used to learn almost everything we know about the interior of the Earth, and we also used it during the Apollo era to understand and measure the properties of the inside of the Moon. We want to apply the same techniques but use the seismic waves that are generated by Mars quakes and by meteorite impacts to probe deep into the interior of Mars, all the way down to its core. Bruce Banerdt: We've put a lot of thought into it. On Earth, you put a seismometer in the basement of a building in a vault, and you keep the temperature constant and you don't have any air moving through and so forth. On Mars, we're putting it out on the surface in a really harsh environment. So what we've done is put a robotic arm on the spacecraft that will pick the seismometer up off the deck, move it about two meters out in front of the spacecraft and put it down in a place that has no rocks and no holes, so it's nice and stable. Once it's out there, the seismometer has two different layers of protection built into it. It's inside a spheroidal enclosure that contains a very hard vacuum, so it's like being inside a thermos bottle. And then we have around that some thermal blanketing that protects it some more from the temperature. Once it has been placed on the surface, our robotic arm then picks up what we call our wind and thermal shield, which is like a big, upside-down wok with a curtain on the sides, and we put that over the seismometer. It's actually got some chainmail around the bottom that'll drape over rocks and seal the bottom against the wind blowing in underneath. By that point, the seismometer is pretty well protected from the elements, although it's still going to experience that huge temperature variation that Mars sees from day to night. Bruce Banerdt: The short answer is, we don't really know. Of course, being scientists, we've got to try to figure it out. Mars is crisscrossed by faults and we can find out how old a lot of those faults are. We can measure how much those faults have been displaced and figure out how many quakes that took. So we can chart the amount of seismic activity over the life of the planet. Some of these faults go back billions of years, and we extrapolate that rate to the present. Of course, [the number of quakes is] is dying off with time as Mars cools down. When we extrapolate to the present, we come up with a frequency of occurrence that gives us an idea that we should see between maybe 20 and 100 quakes over the two-year life of this mission. Bruce Banerdt, pictured standing with the microphone, at InSight's pre-launch media briefing at Vandenberg Air Force Base in California on 3rd May 2018. A model of the InSight lander can be seen in the foreground. We will actually be looking for quakes that happen on the other side of the planet, because what we want to see are seismic waves that radiate out from these quakes and pass through the deep interior of the planet and then come back up, where they are sensed by our seismometers. It's like how, in California, we have seismometers that routinely pick up quakes that happen in Japan, India and the Middle East, and we use the waves from those quakes to probe Earth's interior. As the waves pass through the rocks [inside Earth], the character of the waves changes depending on the properties of the rocks. Jim Green: What do we think Mars' interior structure is like? Bruce Banerdt: All the rocky planets have a similar structure, and we know that from measurements of their gravity, dynamics and so forth. We know that the rocky planets have a very dense metallic core, made mostly from iron and nickel, surrounded by a mantle of very dense silicate rocks that have a high density because of the pressure that they're under, and then the mantle is surrounded by a crust of the kinds of rocks that you can pick up in your back yard. Those rocks have a lower density, and they probably floated to the surface early in the planet's history. So we have, more-or-less, a three layer system — core, mantle and crust — of differing properties. What's really critical is understanding the details of that structure: what's the size of the core, is it pure iron, does it have other elements in it like sulfur or carbon, what's the structure of the mantle? Does it have mostly iron silicates, or is there more magnesium in there? That turns out to be a critical parameter. And then, how thick is the crust, what's its mineralogical composition and how much of the radioactive material in the original dust that made up the planets has been moved into the crust through the process of differentiation? That process tends to concentrate the radioactive materials, and that has a big effect on the flow of heat in the interior, and on things like volcanism and tectonics. Bruce Banerdt: Well, we have data from orbital measurements that indicates that at least the outer part of the core is probably liquid. We can see from the variation of the planet's rotation under the influence of the Sun's [gravitational] tides that it's probably liquid. InSight will be able to tell for certain whether it's liquid or solid by looking at the seismic waves that travel through the core. Liquids can support P waves, which are the compressional waves from quakes, but it can't support S waves, which are shear waves, because those require bending stresses, which you can't have in a liquid. So we'll be able to tell for sure whether the outer core is liquid. Whether there's a solid inner core like the Earth is tougher to figure out. If the mission lasts long enough and we get enough really good data, then we might start be able to see all the way down into the center of the core to see whether it's solidified or not. The SpaceX Falcon 9 rocket carrying InSight sits on the launch pad at Vandenberg Air Force Base prior to launch. The blurred lights are from the mobile service tower being rolled back. Jim Green: One of the things that you mentioned that really struck me is that Mars, like all the planets, is cooling. So we need to measure Mars' heat flow. Bruce Banerdt: The heat flow from a planet is really a measure of the energy that's driving the geology of the planet. If you see mountains, if you see giant valleys that are formed by rifts or volcanoes, those are all being driven by the heat flow of the planet as well as fault activity. The plate tectonics on Earth are driven by Earth's heat engine. The heat is coming up from the deep interior, driving these motions and then being radiated out into space. We know that Mars does not have plate tectonics. We can see that because there's no evidence of that kind of faulting on the surface. But, we also know that it is radiating heat, since it has a history of volcanism. And it does have many faults on the surface even though they're not organized as plate boundaries. That faulting is, we think, mostly driven by the contraction of the planet. As the heat flows out of the planet, it contracts just like anything else as it cools off, and as it contracts, it crumples a little bit. That crumpling is manifested in quakes and seismic activity. Bruce Banerdt: HP3 stands for the Heat Flow and Physical Properties Package. It's really an interesting and cool instrument because it has a little torpedo, about a foot and a half long and about an inch in diameter, and it has a hammer, and a motor that winds up the torpedo on a helical track and pulls it up against a very stiff spring, and it gets to the top and lets go and [the hammer] goes 'pow' down against the torpedo's nose and it knocks it down into the soil just a few millimeters at a time, bang, bang, bang, and it does that about 10,000 times so that it can burrow down up to five meters below the Martian surface. Jim Green: Of course, that's on the deck originally, and you've got to use the arm and pick it up and situate it. Bruce Banerdt: That's right. That's our third deployment activity with the robotic arm. The arm has like three main jobs. It has to put the seismometer on the ground, it has to put the cover over the seismometer, and then it goes back and gets the heat flow probe. Because we have to do things really carefully and get it right the first time, it's going to take us a couple of months to go through that whole process. Jim Green: In addition to HP3 and the seismic instrument, SEIS, you also have wind measurements that you can make. Bruce Banerdt: We've got a whole meteorological package that measures the speed and the direction of the wind. It also measures pressure variations. It's sort of a barometric experiment, as well, plus the temperature of the atmosphere. So, we have a complete weather package. We're planning on putting up a page on the Internet that shows the weather on Mars. I don't think we're going to be predicting very much, but we will at least be able to tell what the weather's like. InSight will land in Elysium Planitia, just north of Mars' equator. Bruce Banerdt:Yeah, we're trying to put together a Mars quake app. The USGS has an app that will buzz when there's an earthquake that's happened somewhere on Earth. We're going to do the same thing for Mars. So it might be running on your phone, and then it starts buzzing in your pocket, and you pick it up and it says, oh, there was a Mars quake out in Tharsis Plateau yesterday. It's not going to be in real time because it takes a couple of days to get the data down, but as soon as we get it on the servers, it's going to go out to the public, and that should be a lot of fun. Bruce Banerdt: Yeah. When a meteorite hits Mars, it makes a pretty big seismic signature. The cool thing about that is, once we've gotten an impact event on our seismometer, we can go back and talk to [scientists working on] the Mars Reconnaissance Oribiter and its high resolution HiRISE camera and say, hey, go check out this area here, we've got an impact that happened maybe 10 kilometers of this place, go see if you can see anything new there. If they can do that it would actually help a lot, because then we will know exactly where it was and we can use all the information from the seismogram to look at the interior and not waste time on figuring out where the Mars quake was. Bruce Banerdt: My gravity assist was the Mercury Program. When I was five years old, Scott Carpenter blasted into space on top of what looks today like a tiny little rocket. My mother insists that I only learned to read so that I could read the newspaper articles about the Mercury program, and I was just completely fascinated and completely entranced by the idea of people going into space. I just followed the space program, and I wanted to be a space scientist some day. Well, I wanted to be an astronaut, which we all thought was exactly the same thing as a space scientist. It's not quite, but close enough. I went to college, and I studied physics, and then I decided to go into geophysics. So I went to graduate school at Penn State where, by some wild coincidence, one of the other grad students was a Caltech grad who had worked at JPL for a couple years before getting his Ph.D. We became friends, and he said, 'oh, you know, the Viking mission is going to Mars next summer, and I know a couple of scientists there that are looking for summer interns, you ought to apply'. So, I applied, and I got selected, and I went to JPL for the summer. And then I went back to Penn State at the end of the summer. And again, another wild coincidence was that my graduate advisor got a job at a university back in California and invited me to come back with him, and I went to JPL and I asked if I could work there part time while also working on my Ph.D., and they said sure. So I grabbed onto JPL and I never let go. This is the only job I've ever had in my life other than working in the tire shop during the summertime.